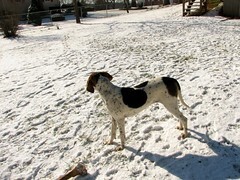 Coonhounds look so regal outside doing what comes naturally. She and the kids romped outside for about 30 minutes. By then, the mittens and socks were soaked so the spirits were dampened as well.